History of Present Illness: This 56-year-old woman presented status post bilateral LASIK for myopia at an outside institution. She reported that after she underwent LASIK, the vision in her left eye was great and had remained good. She felt that the vision in her right eye initially was decent, but never as good as the left eye. She underwent an enhancement in her right eye approximately one year after her initial surgery. She felt that the vision did not improve significantly. Over the past three years, the vision in the right eye had become progressively more blurred, and could not be improved despite multiple changes to her eyeglasses prescription. Estimates of residual stromal bed thickness; centrally, approximately 260 micrometers. 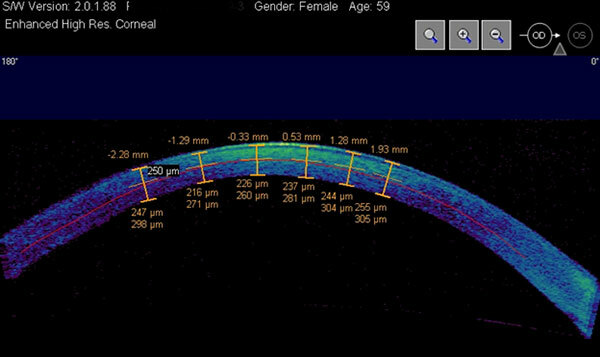 The posterior 250 micrometers of cornea was not violated in this particular case (red line). Unfortunately, preoperative topographies and surgical records were not available. Nonetheless, her right cornea had developed a very abnormally shaped, ectatic appearance. 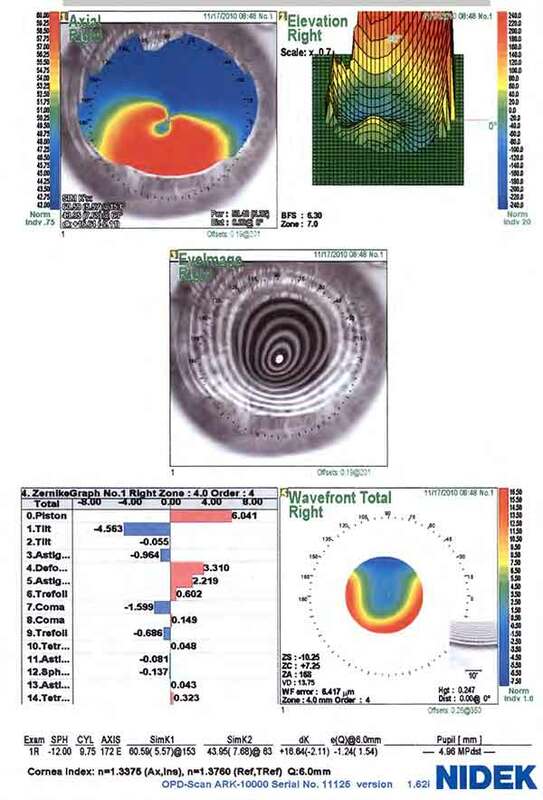 This patient could attain improved visual acuity with a scleral contact lens; however, the contact lens was not tolerable for more than a few hours per day. Given the severity of the ectasia and corneal topography findings, Intacs was not indicated. Specular microscopy was performed to determine endothelial cell density and was found to be 2746 cells/mm2 in the right eye. The options presented to the patient were full thickness penetrating keratoplasty (PKP) and deep anterior lamellar keratoplasty (DALK). [Javadi et al 2010, Shimazaki et al. 2002] Given the adequate endothelial cell density, the decision to undergo DALK was made. DALK surgery was performed using the "big bubble" technique as described by Anwar. [Anwar et al. 2002a, 2002b] Her surgery was uncomplicated. She developed steroid induced ocular hypertension that necessitated a switch of topical steroid formulation as well as transient treatment with topical ocular anti-hypertensives. Her pressure remained controlled on the adjusted steroid regimen and there was no evidence of glaucomatous damage. The initial selective suture removal was performed six months post-operatively, and the process continued until her corneal astigmatism had been sufficiently reduced. One year after DALK, her uncorrected visual acuity was remarkably good, at 20/25. Figure 4. Slitlamp photograph of DALK one year post-surgery. Note clarity is excellent and a moderate amount of sutures are still present. Figure 5. 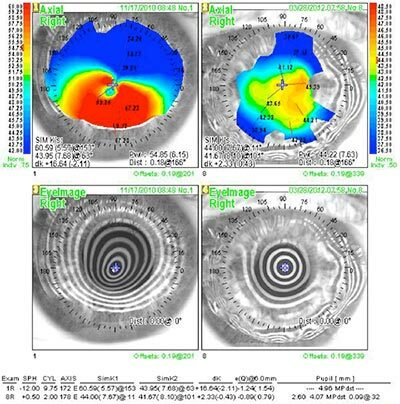 A comparison of preoperative and postoperative corneal topography shows the benefit of DALK. 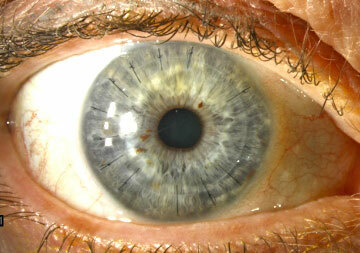 Normal prolate corneal morphology has been restored. Post-refractive surgery ectasia is a loss of corneal integrity leading to corneal warpage that often resembles keratoconus. It is more likely to occur following LASIK, radial keratotomy (RK), or astigmatic keratotomy (AK) surgery. These types of refractive surgeries are more likely to cause ectasia because of how they disrupt the cornea. LASIK creates a partial thickness flap into the corneal stroma; this separation of the flap from the residual bed alters the structural integrity of the cornea. RK and AK involve incisions that extend a moderate depth into the corneal stroma and thus alter the shape and refractive power of the cornea; it is the depth of the incisions that changes the strength of the cornea. While these are the proposed mechanisms, it is important to note that the exact etiology of ectasis is not completely understood. This discussion focuses on post-LASIK ectasia. The exact incidence of post-LASIK ectasia is unknown. With older screening technologies, ectasia occurred in an estimated 1 in 2500 cases. Newer screening technologies have reduced incidence to roughly 1 in 4-5000 cases. [Randelman et al. 2008a] Randelman and colleagues have published extensively on this topic and their proposed risk factors and grading scale are important to assess prior to LASIK surgery. Ectasia is a very serious complication of refractive surgery. In 2005, a committee comprised of the International Society of Cataract and Refractive Surgery and the American Academy of Ophthalmology convened to review this condition following a multi-million dollar legal judgment in favor of a young man who developed ectasia after LASIK. The goal of the committee was to outline known risk factors for the development of the condition. An important statement that was released after the meeting was, "Ectasia is a known risk of laser vision correction and when the complication arises, it does not necessarily mean that the patient was a poor candidate for the surgery, that the surgery was contraindicated, or that there has been a violation of the standard of care." This statement should not deter the surgeon from exhibiting the utmost caution in screening candidates for refractive surgery, but does establish ectasia as a known risk of the surgery. In the authors' experience, post-LASIK ectasia typically is a result of abnormal corneal morphology that has been overlooked prior to the surgery or when the residual stromal bed thickness has fallen below the recommended residual bed thickness. Anwar M, Teichmann KD. Big-bubble technique to bare Descemet's membrane in anterior lamellar keratoplasty. J Cataract Refract Surg. 2002;28:398-403. Anwar M, Teichmann KD. Deep lamellar keratoplasty: surgical technique for anterior lamellar keratoplasty with and without baring of the Descemet's membrane. Cornea. 2002;21:374-83. 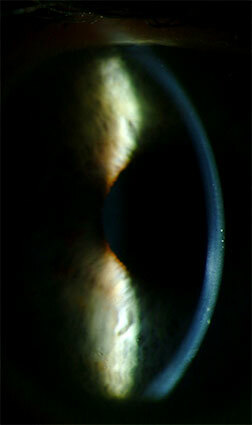 Argento C, Cosentino MJ, Tytiun A, Rapetti G, Zarate J. Corneal ectasia after laser in situ keratomileusis. J Cataract Refract Surg. 2001;27:1440-1448. Javadi MA, Feizi S, Yazdani S, Mirbabaee F. Deep anterior lamellar keratoplasty versus penetrating keratoplasty for keratoconus: a clinical trial. Cornea. 2010;29:365-371. Ou RJ, Shaw EL, Glasgow BJ. 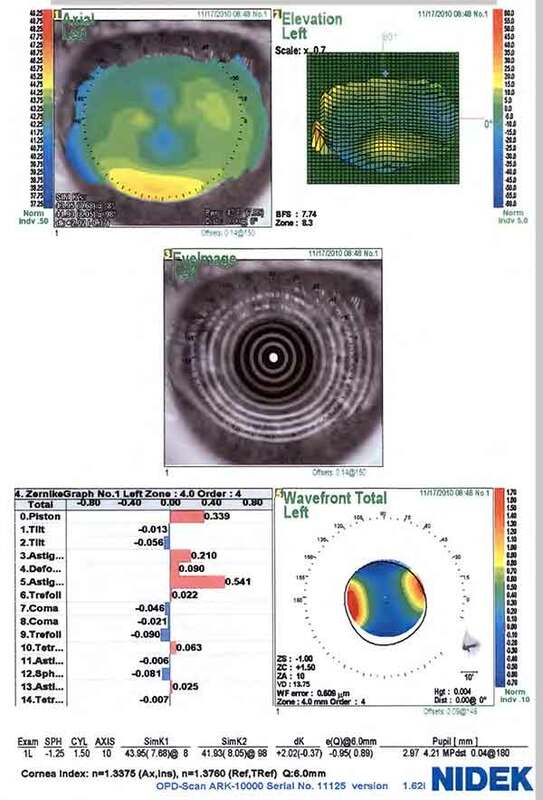 Keratectasia after laser in situ keratomileusis (LASIK): evaluation of the calculated residual stromal bed thickness. Am J Ophthalmol. 2002;134:771-773. Pallikaris IG, Kymionis GD, Astyrakakis NI. 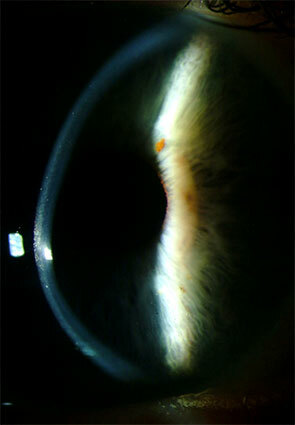 Corneal ectasia induced by laser in situ keratomileusis. J Cataract Refract Surg. 2001;27:1796-1802. Randleman JB, Russell B, Ward MA, Thompson KP, Stulting RD. Risk factors and prognosis for corneal ectasia after LASIK. Ophthalmology. 2003;110:267-275. Randelman JB, Trattler WB, Stultin RD. Validation of the ectasia risk score system for preoperative laser in situ keratomileusis screening. Am J Ophthalmology. 2008;145:813-818. Randelman JB, Woodward M, Lynn MJ, et al. Risk assessment for ectasia after corneal refractive surgery. Ophthalmology 2008;115:267-275. Shimazaki J, Shimmura S, Ishioka M, Tsubota K. Randomized clinical trial of deep lamellar keratoplasty vs penetrating keratoplasty. Am J Ophthalmol. 2002;134:159-165.